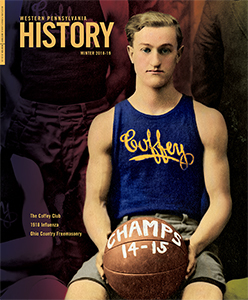 Historical Society of Western Pennsylvania, University of Pittsburgh Press, 1958, 2005. Fort Pitt was instrumental to the British victory in North America and, together, authors Alfred Procter James and Charles Morse Stotz explore the many phases of triumph and failure throughout the race to control the Forks of the Ohio. This book takes a wholistic approach to Fort Pitt and explains numerous elements of the French & Indian War. The unique perspectives of the two authors are enjoyable. James, who started as a professor at the University of Pittsburgh in 1918, focuses on subjects specific to 18th century North American involvements, such as the Ohio Company and General John Forbes. Stotz was greatly influential in the creation process of the Fort Pitt Museum as the building’s main architect. With James’ understanding of the history and Stotz’s expertise in 18th-century fortification, “Drums in the Forest” is an excellent source of information. Today the Forks are known as the Point, though 265 years ago the entire area was forested terrain that experienced tremendous flooding. Even in those conditions, the Forks were a much-desired location to claim. In less than 60 pages, James creates a condensed, yet precise, summary of the history behind the French & Indian War in North America. The first half of the book, “Decisions at the Forks,” is designed to investigate the nations and individual actors that were influential to the Forks. The information in part one of the book invites the reader to think critically about the tenuous relationships between the American Indians, the French, and the British. The French, British, Iroquois Indians, Ohio Valley Indians, Virginians, and Pennsylvanians all claimed to be the rightful owners of the land. Mainly covering the French and the British involvement, James expertly guides the reader through the expansion of the two countries into North America. His ability to weave together a complex history into a palatable analysis is worth much praise. 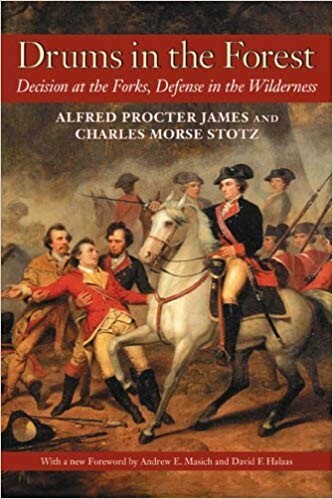 Part two of the book is “Defense in the Wilderness” by Charles Stotz, which is divided into four sections that focus on the four forts built at the Forks. Stotz approaches each section with a vibrant style that allows the reader to easily imagine the environment in such hostile times. Through the inclusion of original blueprints and designs of each of the forts, Stotz explores the reality for British and French soldiers. As an architect, Stotz’s extensive description of the evolution of fortification is impressive. Fort Prince George and Fort Duquesne could not compete with Fort Pitt, which was meant to be a grand symbol of British ownership of the Forks that could withstand French and/or American Indian attacks. Though only Pontiac’s Rebellion would bring the need for protection at Fort Pitt, the brick masonry wall and the enormous size of the fort made the structure exceptional for North America. The passionate writing of Stotz keeps his analysis thriving with purpose. This book shines a new light on an old story. By taking a dual approach to the same subject, readers can embrace two perspectives while developing their own. The Forks were not easily won, nor was the French & Indian War. This book does not shy away from the various battles that took place during the war in North America. Stotz and James combine their thorough analysis to depict the fate of three nations attempting to gain control of the Forks of the Ohio, making “Drums in the Forest” an insightful and educational read. “Drums in the Forest: Decision at the Forks, Defense in the Wilderness” is available for purchase at the Fort Pitt Museum shop. Molly Kennedy was the Fort Pitt Museum volunteer intern during the summer of 2018.